July 3, 2018 (Mooresville, NC) – Jeffrey Earnhardt returns to the Monster Energy NASCAR Cup Series this weekend at Daytona International Speedway, to compete in the Coke Zero Sugar 400 on Saturday night. Earnhardt will be piloting the No. 7 Nine Line Foundation/Xtreme Concepts Chevrolet Camaro with a special paint scheme honoring our active nations service members. As part of the NASCAR Salutes initiative, Jeffrey and his team will present a check to the Nine Line Foundation on Saturday afternoon. Proceeds coming from a commemorative t-shirt sold online, will help the Nine Line Foundation in their efforts to build housing for homeless veterans in the Savannah, Georgia area. 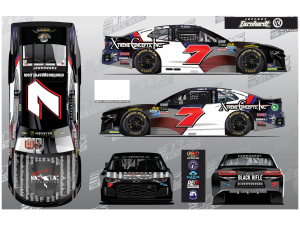 In addition, Xtreme Concepts and Earnhardt will be presenting four service members with emotional support dogs on Saturday at the Team Chevy Display. Fans are welcome to attend the presentation at 3:15pm in the Fan Zone. The green flag waives at 7pm on Saturday July 7, with live coverage on NBC. For more information on the Nine Line Foundation visit www.ninelinefoundation.org. For up to date information on Jeffrey Earnhardt, follow www.jeffreyearnhardt.com.